All cheeses start as raw milk. We are required by Canadian law to pasteurize our goat milk, except for cheeses that are going to be aged more than 60 days. 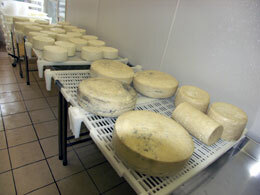 We use raw milk for our hard cheeses that go through an aging process of at least 4 months. Pasteurization is a very simple process that begins by heating the milk to a temperature of 63 degrees Celsius for 30 minutes. We ensure that the milk is cleaned of any potentially dangerous bacteria or micro-organisms. As soon as the milk has turned into firmed curd the really hard work starts. The fresh cheese’s curd has been drained for 24-36 hours in draining bags. The rind cheeses curd is cut into squares by our cheese vat’s knives. We let it set for another hour to let most of the whey out of the curd. After the hard cheese’s curd has been cut into squares, it is stirred for a while to let the curd lose as much whey as possible and to let the curd firm as much as it can. When the curd gets to the right flexibility and temperature, we drain the whey out of the vat while gently stirring the curd. The molding stage has to be done fast enough so the curd will not loose it’s flexibility and texture. We ladle the curd into the desired mold and let it set for 24 hours. During this time we flip the curd that has already started to get the shape of the cheese. 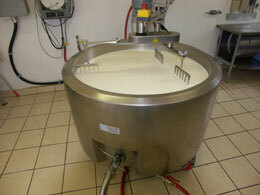 During this process the curd keeps draining and loosing whey over the draining tables. The dairy plant is controlled by climate control year round to keep the best conditions for cheese making. Different stages of aging are taking place in our dairy. The fresh cheeses are ready to eat as soon as they are packed. The rind cheeses are stored and aged in our climate controlled walk in cooler for 4-6 weeks. The hard cheeses are taken to our aging cellar, which is located under ground just like a wine cellar. Even the temperatures are almost the same. They are aged there for at least 4 months. The longer it ages, the better the cheese will be. During the aging process we flip the cheeses over almost every week to let the bacteria that is being developed inside the cheeses grow even.